Halloween! One of the most child-centred and fun ‘holidays’ out there, Halloween season brings about so many fun stories and books to share with children. I love Halloween, I love ghost stories and I love books, so obviously this time of year is like, 100% Ashley-approved. We know that representation matters. We know that it matters for black and brown children to see themselves in media. We know it matters for white children to see black and brown children in media. And we know that holidays and how we represent and talk about them in classrooms matters. So when children are seeing holiday stories- stories about days our culture has deemed important, stories about cultural touchstones we’re all supposed to related to, stories about children having fun and celebrating significant days- that feature only (or primarily) white children, that’s a problem. In the spirit of diversifying children’s libraries and school bookshelves everywhere- here’s a list of some of my favourite Halloween books. Most of them feature children of the global majority. 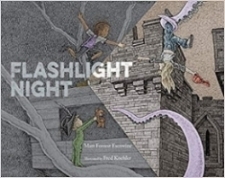 “Flashlight Night” by Matt Forrest Esenwine is a fun, rollicking, spooky romp following three children traipsing around their backyard at night with a flashlight. It’s an ode to childhood imagination and while it isn’t Halloween specific- it’s one that features monsters and spookiness and fits in well with the spirit of the season. 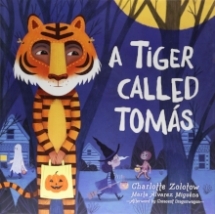 “A Tiger Called Tomás” by Charlotte Zolotow is an absolute classic for many reasons. This recently released new edition of it is gorgeous and features Spanish words and phrases sprinkled throughout. Following a little boy who is anxious about having just moved, it’s sweet, is totally relatable for any child who has ever felt like the odd one out, and is lovely. “Behind the Mask” by Yangsook Choi is one of my favourite Halloween stories. A little boy decides to be his grandfather for Halloween, and his friends all scoff at the idea- without knowing that his grandfather was a traditional Korean mask dancer. It’s a lovely story that blends two cultures- something children of immigrant parents will recognize and connect with- and it’s beautifully illustrated. “Monster Trouble” by Lane Fredrickson is hilarious and features one of the best named protagonists in children’s literature- Winifred Schnitzel. A clever little girl who tries to stop the neighbourhood monsters from keeping her up at all hours, it’s smart, funny and not so scary at all. While it isn’t Halloween specific, it definitely fits the season. 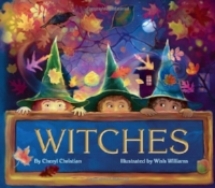 “Witches” by Cheryl Christian is a colourful, rhyming romp that is an absolute joy to read aloud. It features children of all colours, and even includes children with physical disabilities- without drawing attention to that fact; the children in chairs are just there, participating in trick or treating with the rest. It’s fun, colourful and a delight with so much casual diversity in its pages that I can’t help but love it. Finally, while these three stories have nothing specifically diverse or even human about them- “Stumpkin” by Lucy Ruth Cummins, “Pumpkin Soup” by Helen Cooper and “The Legend of Spookley the Square Pumpkin” by Joe Troiano- they top my list of favourite pumpkin related stories and all actually feature good messages of inclusion, kindness, and respecting and embracing differences. All three are favourites in my classroom- including “Stumpkin”, which I only discovered last week! There you have it. 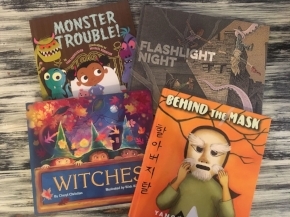 Some of my favourite Halloween themed picture books. All I’ve used in my class, all I love personally, and I hope you find some new favourites from this list! And if you have other inclusive Halloween books to share, I’d love to hear about them!